Daddy, can we put on of these in the backyard? On short notice and thanks to the tip of a reliable friend, the boy and I headed out to the Southern Farm Show on the State Fairgrounds. Now this is not the State Fair where kids are expected. 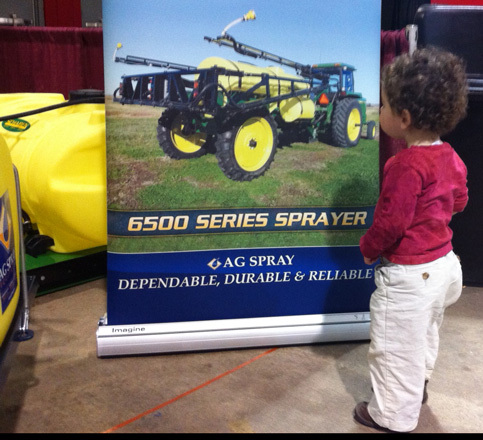 This is a trade show for farmers. And we all know what farmers do. They have dogs. They have cows. They ride big friggin’ tractors. I mainly went for the tractors; my son is at the stage where everything with wheels deserves a “Wow!”. Anything that looks more exciting than a car or bus is a dee-tee, from ‘digger’. There were lots of dee-tees. 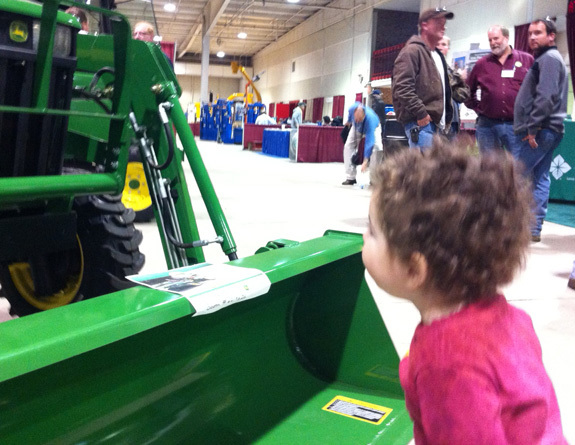 I was also not the only father, it seems many farmers brought their kids, so I tried to blend in as we studied the offerings of the farm equipment industry. ... upon further inspection of this image, I realize that maybe our "farmer and son" disguise had been busted. We enjoyed it anyway. Before going, I looked at the program (always a good idea), and saw that a cowdog demos was scheduled for that day. Cowdogs are herding cows, and they are pretty good at it. We were both impressed by the half-hour demo.. The next Southern Farm Show will be in a year (1/30-2/1), so mark your calendars. However, we’ll be heading to the fairgrounds before that, in May (18-20) for the “Got To Be NC Festival”, formerly known as NCAgFest. This entry was posted in Animals, Machines, Review by daddyweekly. Bookmark the permalink.